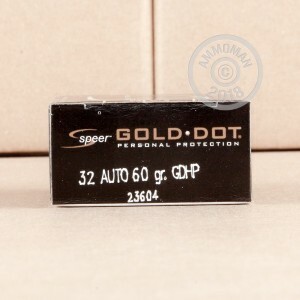 If you want your .32 ACP pistol to punch above its weight, carry Speer Gold Dot ammo. 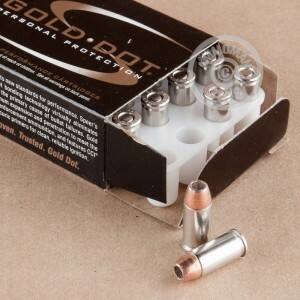 These cartridges fire a 60 grain hollow point bullet with a molecularly bonded core that delivers reliable penetration and expansion every time, with no risk of core-jacket separation. Speer engineers have specially optimized these projectiles to perform well in the compact .32 Auto. 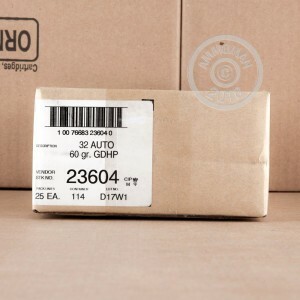 Gold Dot ammunition is loaded in Lewiston, Idaho using non-corrosive Boxer primers from Speer's sister company CCI as well as nickel-plated brass cases that will withstand the rigors of long term carry. Place an order for $99 or more at AmmoMan.com to get free shipping!